Fried Rice | eat. cook. blog. 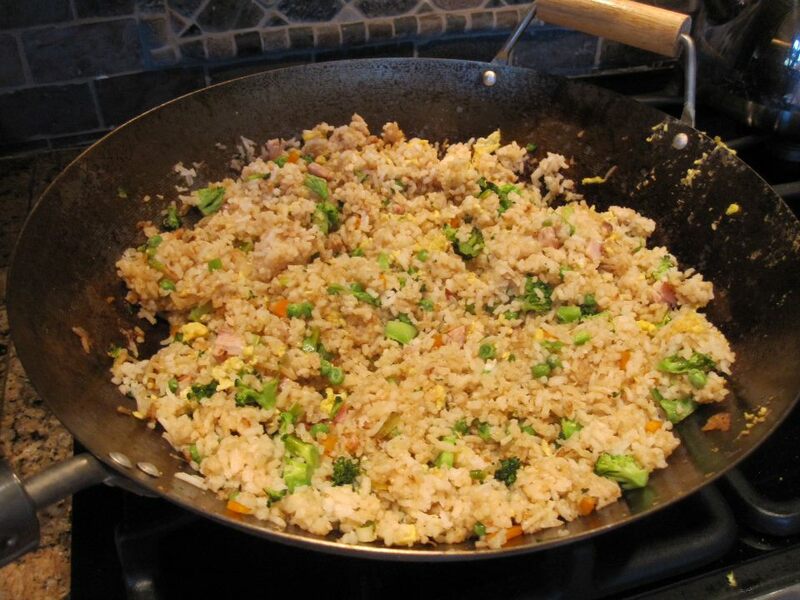 Fried rice is best made with cold rice. Leftover is even better (like after you’ve had Chinese take-out and you have rice left over). If you’re cooking it fresh, let it cool before using. Cooked rice freezes really well, too (see note at end of recipe). This recipe is adapted from a Sunset Magazine “Chinese Cookbook” I’ve had for many years. Copyright 1979 in fact. And if I have any other veggies on hand, I’ll add them…chop really small and stir-fry for just a minute or two. In small bowl, beat eggs. In a wok or wide frying pan, heat 1 tablespoon of the oil over medium eat. Add green onion and stir-fry for about 30 seconds. Add eggs and stir until soft curds form; remove from pan and set aside. Heat another tablespoon oil in pan. Add shrimp (or pork, ham or chicken) and frozen peas. Stir-fry for two minutes to heat through; remove from pan and set aside. Heat the remaining 2 tablespoons oil in pan. Add rice and stir-fry for two minutes to heat through. Stir in soy sauce. Stir in shrimp (or pork, ham or chicken) & pea mixture. Add eggs and fold in until they are in small pieces. Serve, garnishing with sesame seeds and diced green onions. When preparing rice, make extra. Packaged in heavy-duty resealable plastic bags, cooked rice will keep in the freezer for up to 6 months. To reheat, add 2 tablespoons of liquid for each cup of rice; cut small slit in plastic bag and microwave until heated through (about 2-3 minutes).